Turmeric milk is widely being used to help kill viruses and keep your immune system healthy. It’s suggested that you drink a cup of turmeric milk daily however in my house well, I typically drink 2 cups a day; one at night and one in the morning. I might even have an extra cup in the afternoon when the cold and flu season are abound. Turmeric has been around for a very long time, matter of fact, the history of this powerful spice dates back nearly 4000 years and in Asia turmeric is also known for it’s religious aspect. Turmeric is mostly used due to it’s anti-inflammatory properties which also helps your body to fight infection. Turmeric milk is good for your overall good health and to help you fight off the common cold. in our recipe we use other anti-inflammatory ingredients which will help to keep your immune system healthy and also fight off and in many instances; kill bacteria. To get enough of this anti-inflammatory superfood you need to get upwards of 500mg to 1,000 mg of the curcuminoids every day. To get that much you will need at least 2 tsp or more which can vary depending on the brand and where it originates. Turmeric will work hard for you fighting inflammation on the molecular level. I’m not a scientist so without getting all sciency and complicated on you can go here to read more about that science and molecular level stuff. One thing I do know is it works and I keep using it because I rarely get sick. The benefits of the antioxidants are so powerful and they protect your body from free radicals which are the toxic byproducts of oxygen metabolism which cause havoc to your cells and tissues. To get the most benefit of turmeric it needs to be present with black pepper. Black pepper has piperine which helps the curcurmin to be absorbed in the body more effectively by over 1000%, so in our milk we’ve added black pepper, your beverage will be a little spicy but it will be more effective than some of the other recipes out there. Ginger is another powerhouse to have in your pantry at all times, not only do you use it in your turmeric milk but also you should be using it in your smoothies daily. Ginger is best known in asian cooking and many use it too smoothe an upset or nauseous stomach. Using ginger on a daily basis can help kill the bacteria rhinovirus that causes a cold. But why wait until you get sick? Start using ginger daily which can be beneficial to keeping your immune system strong and healthy by killing off those nasty unwanted bugs and viruses before you get sick. 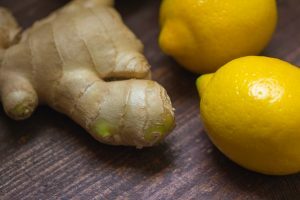 Should you find yourself down with a cold add this simple little cocktail to help soothe your throat and reduce inflammation. 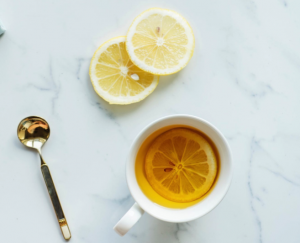 Add ginger and lemon juice to a cup of hot boiling water sweeten with a little honey to help soothe a sore throat and help this sour drink a little more palatable. What is coconut good for? Recently people are discovering that coconut is good to help with weight loss and I agree and use it myself for that reason. Many people are using coconut oil to replace oils and butters in their recipes which is an excellent way to get more of the benefit of lauric acid from the coconut. The monolaurin is derived from the lauric acid is a medium chain fatty acid which helps kill off viruses, fungi and bacteria. Not only is it good to use internally but topically as well and since anything you put onto your skin soaks into your body you will gain the additional benefit of this powerful superfood. I suggest getting a big tub of organic, extra virgin coconut oil , I’m sure you will find many more uses for this superfood. You can start by replacing your moisturizer and slathering coconut oil all over your body, add it to your turmeric hot detox milk and don’t forget to add coconut your smoothies. We love to hear from you so be sure and share your ideas in the comment section below. Who doesn’t love some cinnamon? 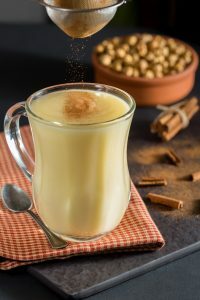 We typically associate cinnamon with the fall season and use it to spice up pumpkin pie or put into hot chocolate or simply simmer cinnamon sticks on the stove for a natural air freshener however; you should consider consuming cinnamon all year to help reduce inflammation and fight infections. Cinnamon is loaded with powerful antioxidants and it’s main ingredient is cinnamaldehyde which is known to fight infections in the respiratory tract and effectively fights all kinds various infections. Even the kings back in the Ancient Egypt days knew how valuable cinnamon was as the kings highly regarded it and accepted it as a gift. It’s especially important to use Ceylon Cinnamon which is known to be the finest cinnamon from the inner bark from the Cinnamomum verum trees grown in Sri Lanka, Madagascaar and in the Seychelles. You can also find cinnamon on the inner bark of several different varieties of the evergreen tree. When the bark is shaved and dried it becomes a curled up cinnamon stick and I use them the cinnamon sticks to spice up my afternoon tea. Whatever ways you use cinnamon just be sure to incorporate it on a daily basis to help keep your immune system healthy.